First, a Quick Confession: True story – if it weren’t for my friend “Nickel-Pickles,” I wouldn’t know anything about diamonds. My company just hired her away from a diamond store, and I did the training for her new job. Well, she ended up training me about good and bad diamonds. I didn’t know there were bad diamonds. It’s a diamond so it has to be good, no? Uh…NO. The “Good Man” Treasure Hunt: Ladies, how many of you are looking FOR a “Good Man”? You’ve planned, plotted, prayed, pleaded, possibly even gotten pregnant – all in the quest for the elusive “Good Man.” And along the way, you may have been lied to, led astray, hoodwinked, bamboozled… When you thought you had a “Good Man,” he turned out to be a loser. How can you avoid this pitfall? Well, it’s not easy. Women have a tendency to look AT a man’s “potential,” and take a risk on a relationship with him. But just like with diamonds, you need to know what you are looking FOR, and know what you are looking AT. 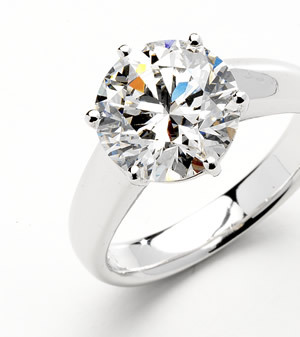 Make sure the stone is a diamond in the first place – and start your haggling from there. Buying a diamond means you are ready to drop some serious cash at the jewelry store. Some people save up for years to get the right one. How horrible would it be to drop 5 G’s on a diamond only to find out that it is a cubic zirconium, AND the retailer is mysteriously out of business? Similarly, some women have been saving up all their emotions, love and generosity, just waiting on the right guy to spend it on. Yet sometimes they get antsy and just give their all to the first person that looks like what they want, but isn’t worth what they are spending. You expect to get back the love you give, right? Don’t waste your energy trying to shine up a piece of dirty glass. ‘Cuz you can polish glass all day, and it will never sparkle like a diamond. 2) Barack was already working at a law firm when they started dating. He had already achieved a good deal in his life. 3) Michelle would have been happy with him as her lawyer/community activist husband. President of the USA was just an unforeseen bonus. 4) RECAP: Barack was gainfully employed, serious about pursuing a relationship, and Michelle was happy with him THE WAY HE WAS WHEN SHE AGREED TO MARRY HIM. Their love story is NOT one of “potential.” It is a story of a strong-willed man meeting and capturing the heart of a strong-willed woman – both of whom were awesome in their own right. So please stop using the Obamas an example of a woman dating ‘potential’. That was just dating. But it is a nice love story. 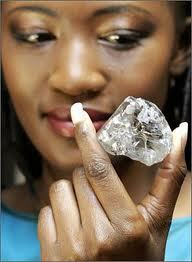 Unfortunately, when it comes to choosing men, some women can’t tell the difference between a diamond and rock salt! Just because it’s shaped the way you want it doesn’t make it a gem worth all of your “assets.” Sure, it’s okay to consider dating a man who has “Potential,” but be sure he has plans to put that “potential” in motion. Is he a rock on a hill waiting on someone to throw a big break his way? Or, is he walking the talk? Does. He. Have. A. Plan? If you are dating a guy who says that he wants to start his own business, what steps is he taking to start it? Better yet, do YOU know if what he is saying is true? How can he start a business if he is on the couch eating up all the groceries you bought and playing Xbox every afternoon? Is the potential you are looking AT the type of potential you should be looking FOR? Is it any surprise that she ended up the way she did? Art imitates life, right? Apparently, Whitney can’t tell the difference between a diamond and a broken crack pipe. marry you. Notice – I didn’t say that he would propose in a year!! But after that much time, you should at least be having conversations about the end game. Chris Rock said it best: “If you have been dating for three months, and you haven’t met any of his friends, you are NOT his girlfriend.” Extrapolate that out – if you have been exclusive for a year, and you haven’t met anyone in his family, you are not even on the list to be “the one.” If you are dating just to have fun, then fine, this won’t matter. You and he can just keep it at Relationship “Potential,” ad infinitum. 3) Earning Potential: (see earlier statement) If he is not gainfully employed or has no prospects for such – leave him alone until he does have some form of employment. If he wants to be with you, that’s not asking too much. Everybody under 60 needs a job. I know things are hard in this economy, but that’s where that whole “Does. He. Have. A. Plan?” matters. Is he hustling hard? Or is he hustling YOU? Don’t feed stray dogs. They will keep coming back for more, and they won’t learn how to hunt. If you are supporting a man who can’t or won’t even bring a real loaf of bread to the table (let alone a paycheck), don’t be surprised when you start piling up debt. At this point, you’re not a “ride or die” chick. You’re a single mom. 4) Compatibility Potential: Say you meet a “Good Man” who has a job, good credit, single, and looking for a female partner. Eureka!!! Right!?!? WRONG. Stop writing his last name after yours on Post-Its and THINK. Are you and this man compatible? Are YOU what HE is looking for? This is where so many relationships fail. And women – it’s all YOUR fault. Yes YOU!! You bend over backwards to become the type of woman that this “Good Man” wants. After a year or two of pretending to be his version of “the one,” you might even get married. Then what? Can you fake it for the rest of your life? No. No you can’t. And if you try, you are only going to end up hurting him, yourself, and any children that you brought into this world. I’ve seen this happen, and the effects are DEVASTATING. Stop pretending to be someone you are not. And don’t try to change him into something he is not. You wouldn’t buy a diamond that had only 3 of the 4 C’s would you? Well, don’t skip the “compatibility” criterion either because it is why so many people get divorced between years five and ten. Here comes the sad part… The woman may go on to try another relationship. The man who thought he had a good woman and was lied to, led astray, hoodwinked, bamboozled…? He is ruined for life. His emotional state will be radioactive for the next ten years. After that, he won’t even care about relationships. Congratulations, stupid girl, you’ve destroyed a diamond. If you know a confirmed bachelor around the ages of 48 – 55, ask him what happened. See if you get a story like this one. Buyer’s Remorse: Once some women figure out their relationships weren’t worth it, they have nothing left to give so they end up broke and bitter about it. Yeah, nobody likes those women. You can avoid being a “Bitter Black Woman” simply by making sure that the ‘gem’ you are considering meets all of the above criteria. It’s not a laundry list of little nit-picky things. These are basic criteria to have, and some may mean more to you than others. But all four should be there. (Note – Availability is ALWAYS non-negotiable, Whitney!) And every woman out there knows that sometimes when you go shopping, you don’t find what you are looking for on the first trip. If you don’t know what you are looking at, ask questions. If you don’t see what you are looking for, keep looking. 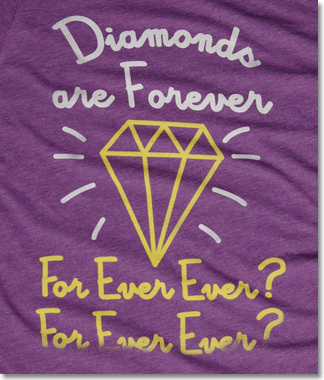 Wait on the diamond, ‘cuz diamonds are forever! (Cue DeBeers commercial). Rant #37 done, and I’m out.